Leading Wholesale Trader of dry wall joint tape from Hyderabad. 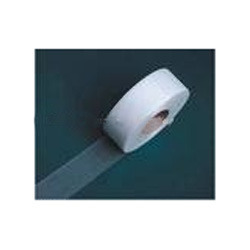 Dry Wall Joint Tape offered are fiber glass self-adhesive mesh tapes that are made using coated fiber glass with acrylic self adhesive latex and finds usage for covering seams which are common in process of drywall construction. Further, the use of these tapes make it possible for achieving perfectly smooth surface as well as in providing work finished appearance that is not achieved otherwise. Made available in plain paper and fiberglass options, these tapes completely blend into wall while covering gap or seam.